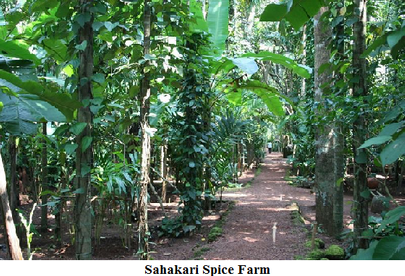 The lush and inviting Sahakari Spice Farm is a far cry from its origins that began in but 4.5 Ha (Hectares) of cultivable land and 55 Ha of barren land in 1979. An amalgamation of modern scientific techniques and mixed crop farming has yielded bountiful results by way of whetting the produce from the loins of the earth and providing a livelihood to many. ‘Kulagor’ is the local term used for mixed crop farming which is the signature of any modern spice farm. These plantations have been making the best use of all natural resources without in any way being detrimental to the environment. Solar energy as well as organic sources of manure such as cow dung and compost are utilised. Age old water harvesting methods are combined with the use of sprinklers for the purpose of irrigation. The sloping terrain of the plantation is dotted with cashew nut trees and about with cashew nut trees and about 46 Ha of barren land has been transformed into a verdant landscape by introducing economically profitable fruit bearing trees and plants, spices and medicinal herbs since the year 1979. At present it has 130 acres to its credit with 60 acres devoted exclusively to spices, fruits, medicinal trees and herbs. Sahakari Spice Farm, which was nominated for the prestigious Annual DRV International Award 2005, is located in Curti in the taluka of Ponda and attracts scores of tourists from abroad as well as other Indian states. It serves well as a reminder to most that our fragile environment needs to be cared for and that the cost of doing so is not necessarily exorbitant or overly tedious. Apart from its attractions of folk dances such as Fugdi, Jagor and Dhalo; swinging in between trees where the art of climbing tall Betel-nut palms and then swinging from these is demonstrated to guests; and elephant washing and riding, visitors are schooled in the knowledge of the various spices grown in the farm along with their use in local cuisine and their benefits as an alternative form of medicine. This column seeks to bring to readers that same information in unison with easy to cook Goan recipes as enjoyed at Sahakari’s rustic restaurant, and simple home remedies derived from spices and herbs. The recipes have been taken from a recipe book compiled by Sumedha Kotibhaskar in response to the suggestions and queries of visitors. Ingredients: ¼ Kg Basmati rice, 2 tbsps of ghee, ½ cup of cashew pieces, 2 tbsps of dried grapes, 6 cloves, 10 threads of roasted saffron and ¼ Kg sugar. Preparation: Melt the ghee in a non-stick deep frying pan. Add cloves, rice and fry together for 10 minutes. Add water and cook it just like plain rice. Add sugar, grapes, cashew pieces and salt (as per taste). Stir it till the sugar disappears. Cook till it solidifies. Add the roasted saffron threads to a spoonful of hot milk and mix it well. Add it to the rice and stir it if necessary. Ingredients: 1 cup of lentils, 1 chopped tomato, 1 tbsp of sunflower or coconut oil, ½ tsp of cumin seeds, ½ tsp of mustard seeds, ½ tsp of turmeric powder, 2 pinches of asafoetida, 10-15 curry leaves, salt and sugar to taste. Preparation: Cook the lentils well and mash them. Heat the oil in a non-stick deep frying pan and add mustard seeds, cumin seeds, asafoetida, turmeric powder and curry leaves. Add chopped tomato and mashed lentils. Add sugar and salt as per taste and cook for 10 minutes. Remedy For Allergies: Make a mixture of the juice of half a lime and honey. Dilute it in a glass of lukewarm water. Take this concoction first thing in the morning for three months. It is effective in getting rid of various types of allergies.